Celebrating NYC Restaurant Week, my father, sister, and I took advantage by dining at Gotham Bar and Grill; located just off Union Square, it’s nestled on 12th between 5th and University Place. The dining room was airy and open. The pillow-hung lighting creates a spacious effect while suffusing the room in soft golden light. Tables are arranged close together without being cramped, and the attire around us ranged from business casual to formal. Service was attentive and knowledgeable, our waitress ably handled our more technical questions and we never had to request our wine glasses refilled from the bottle. It also bears mentioning the waitstaff was smartly dressed in black ties, vests and slacks with not a knot out of place or a shirt untucked. The maître-d was affable and made conversational rounds through the dining room without ever being intrusive. Between the three of us, we ordered and shared almost the entirety of the lunch Prix Fixe. Quality and freshness of ingredients shone through the dishes throughout. The bean salad was crisp and lightly dressed and the gazpacho cool and refreshing. The Striped Bass Crudo bears mentioning; Wild Striper is a tough fish to do raw, in my experience, and I was impressed. Three thin filets arranged under mixed greens with radish and jalapeno were the perfect texture, lightly chilled, and delicious. The watermelon-lime emulsion was where the dish really shone; the lime was perceptible only in accenting the coolness of the watermelon and how it had begun (only very slightly) to cook the fish at its edges. I didn’t try my father’s halibut, but the chicken was moist and flavorful with the white wine reduction shining through. I had ordered the steak (pictured), and it was exceptional. The edges were caramelized to perfection, crisp and savory but unblackened. I had ordered it rare. The bordelaise was striking, just the right consistency to cling to the steak and add a tangy sweetness without overpowering the meat’s own flavor. The sorbet was pretty standard though the pear gets a shoutout; it’s not an easy flavor to maintain but they’d managed to amplify its intensity without making it syrupy. The Gotham Chocolate cake was the standout dessert. It tread a perfect line between flourless and normal chocolate cake. The only way I can describe it is that it was, paradoxically, simultaneously fudgy and cake-like. 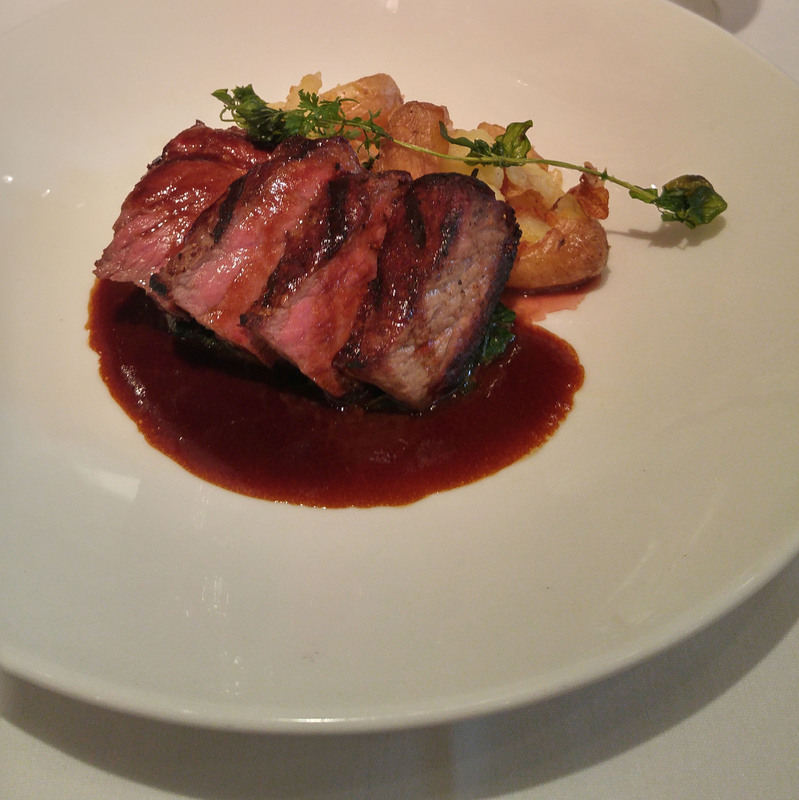 Overall, Gotham Bar and Grill provided a stunning dining experience – one I will return for again in the future.